The goal of the Department of Molecular Biophysics and Biochemistry is to understand life processes in terms of organic and physical chemistry. This necessitates a wide spectrum of research and teaching that encompasses the full range of molecular biophysics (including structural studies, energetics, molecular design/engineering, computational chemistry and genomics) as well as prominent areas in the molecular biology and genetics of prokaryotes, eukaryotes, and viruses. This spectrum interfaces both with the physical sciences in the Faculty of Arts and Sciences and the preclinical and clinical departments in the School of Medicine. Indeed, the Department views itself as a bridge between these geographic/administrative and intellectual extremes of the biological sciences. The Department’s size and distribution of interests is designed to be broad enough to make this a substantial bridge, but small enough to be a truly cohesive functional academic unit. 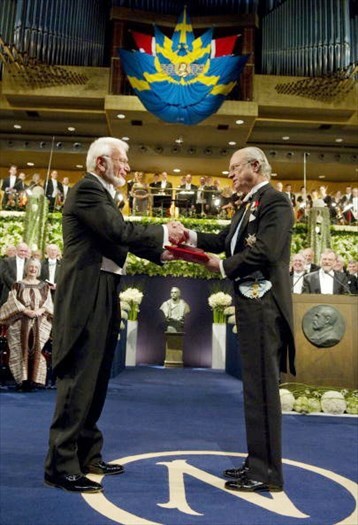 MB&B Seminar: "Wolbachia, Big Sur and African River Blindness"
Thomas Steitz of Yale University receives the 2009 Nobel Prize in Chemistry from King Carl XVI Gustaf of Sweden.